The CT 225 is a small PA speaker, affectionately called "little bawler" by Klang+Ton. This speaker contains the img Stage Line MHD-190 tweeter(by Monacor) and a Celestion TRUVOX-0510 bass driver. ... "At the beginning of the listening test two things became immediately apparent: the CT 225 is extremely dynamic and possesses a surprisingly good three-dimensionality"; ... "Playing dynamic pop music the Cheap trick pampered me with what I like so much when listening to horns - the direct, immediate sound coming from instruments like saxophone and trumpet. Fine nuances in volume changes, as well as the extremely direct way of reproducing ambient noise cannot be matched by a dome tweeter. Also some raucous vocals sounded lifelike and vivid, something that cannot be achieved by conventional tweeters. The overall sound, however, was certainly not too loud or had too much presence, although the CT 225 possesses a rather bright timbre. There was no unpleasantness at any given time. 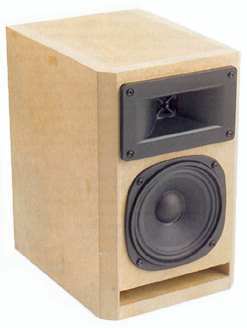 I was surprised that this speaker performed without missing too much at the bottom end when placed away from the wall. It's true that this dwarf hardly developed any pressure in the lower range, but above approximately 70 Hz the sound was surprisingly dry and vehement. Anyway, I had to grin quietly to myself about the verve, dynamic and volume displayed by these midgets, almost thrashing high-end speakers of a similar size. Finally, I wanted to know how loud I could really go. Gradually I put-up the volume until the bass / midrange drivers began to soften the bass. There was nothing to criticise since the volume was at a point where I could feel the floor vibrating, something that nobody can endure for longer than five minutes, with the exception of hearing-impaired disco fans. The Chip Trick 225 is nothing for conservatives and classic lovers, it's rather a muscle man for lovers of dynamic material. It's the ideal speaker for pop, rock and techno, but then a wall should be right behind. The CT 225 is also good for home cinema, since there is already a lot of oomph without having a powerful amplifier. I can't remember the last time I had so much fun given the price. " - Celestion TRUVOX-0510 bass driver. Should you wish to use a crossover with higher quality components, please contact us. Considering the ripple content of the frequency response, however, this doesn't seem to make much sense.